Before purchasing an electric heater, find out what to look at and find the best baseboard heater for the area in your home. Baseboard heaters come in various lengths to accommodate the area you need to heat. These heaters come in both the 120- and 240-volt models. Adding baseboard heaters give you the option to add extra heat in rooms that may need additional heating. Be sure to size the electrical wiring to the heater that you install. Be sure to keep flammable materials away from baseboard heaters. In this article, I'll explain where to place baseboard heaters and where not to. Before installing baseboard heaters, please follow all electrical codes associated with them. Other things to consider when installing baseboard heaters is its location as relating to floors. Your home may have many different types of flooring like carpet, vinyl, tile, or hardwood. Each has its own specific requirements as it relates to baseboard heaters. Obviously, we don't want to place baseboard heaters directly on a carpeted floor that could ignite due to the interaction of the carpet and heat of the heater. tile floors are very different and would not be something that would catch fire. Be sure all electrical connections are secure and of the right size. Never try to add too many heaters to a single circuit. Double-check the wattage of each heater and try not to load the circuit over 75%. Now, let;s look over each of these items in detail to help you out with baseboard heaters. Baseboard heaters come in two styles, 120-volt or 240-volt heating styles. Although 120-volt baseboard heaters are the popularchoise because it uses only a single circuit, 240-volt baseboard heaters are much more efficient because they utilize both legs of power, cutting the power demand sometimes in half. Baseboard heaters are in need of a dedicated circuit to supply enough power for proper functionality. The general rule of thumb is that baseboard heaters need a 20-amp circuit that requires a 12-gauge wire for either type heater. This means that just adding it to an existing circuit that already has a circuit load is not acceptable. 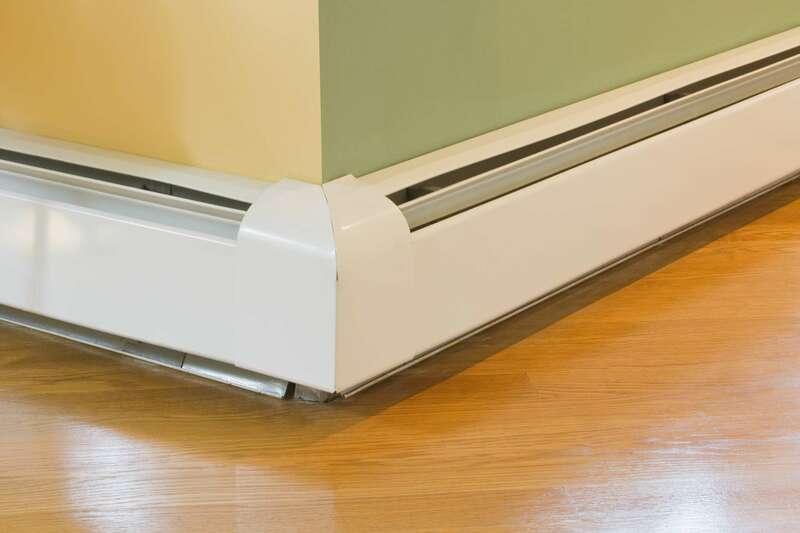 Baseboard heaters can be installed under windows in a home. The thing to keep in mind is to keep curtains and window coverings a reasonable distance from the heater. The plus side is that cool air coming from the window area is warmed before it hits the floor. The other plus is that generally, you don't have furniture under the window area. That makes the baseboard accessible to an open area, great if you have a baseboard-mounted thermostat. Baseboard thermostats can be mounted on the baseboard heater or on a wall within the room. Never place the thermostat directly above the heater or it will not function properly. You see, the heater will come on, warm the air, the thermostat will turn off the heater till the air cools, and the cycle will start over again. Instead, locate the wall thermostat on an interior wall so the heat will have time to cover the area of the house before the thermostat turns the heater off. Baseboard heaters should not be placed under wall outlets. The danger that extension cords drape over the heater and can cause electrical fires. You wouldn't run a cord over a hot stove and this is no different. Think about the general area of the room and the where the best location is. Think about how you use plug-in devices and where the extension cords will be. Baseboard heaters should be mounted on the wall and not set in direct contact with the floor. Remember to maintain at least an inch of clearance under the baseboard heater. This keeps the heater a safe distance from carpeting or flammable flooring. Baseboard heaters and flammable materials do not mix. Flammable materials should not be stored near baseboard heaters because the heat can cause things like pressurized cans to explode or ignite. Better safe that sorry and store these materials in a cool area within a storage cabinet.